The Craft Hot Spot: Welcome to The Craft Hot Spot! Welcome to The Craft Hot Spot! The Craft Hot Spot is a web page that was made to keep track of all paper crafting events! We wanted it to be a place where you could stop by and know what awesome stuff the week has in store! Every Monday a post will go up with all of the events going on for the week! Then on Thursday another post will go up with the "Weekend Roundup". We really believe that this is something that is going to be useful for each and everyone one of you! So feel free to become a follower, sign up for email updates, and "Like" us on Facebook. This way you will always be up to date! In honor of our Official Launch we are doing a giveaway! 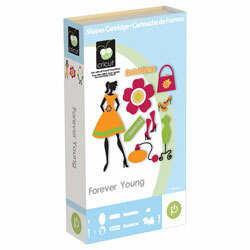 Leave us a comment telling us what you think of The Craft Hot Spot for a chance to win a Forever Young Cricut Cartridge!!! Thanks for visiting us today and hope to see you back again Monday for the first Event Post! This is AWESOME!!!!!! I LOVE THIS IDEA! This is a great idea!!!! It's so hard to keep track of all the great things that are going on during the week!!! I know this will be very useful! I think this is so awesome!! I am new to blogging and was just whining about not knowing where and when all the challenges were. This is going to make it SO much easier! And I'm definitely going to submit my giveaway coming up as soon as I reach 200 followers! 5 more to go :) This is GREAT! SUper cool!!! Thank you so much girls, you are the best ;0). I think we all needed this! Good luck with the new blog :0). I think this is a very good idea!! I can;t wait for future updates and announcements! Good luck! Love the idea. One place to find anything related to papercrafting. I will be back. I think it's great! I just hope you don't stop on your own blogs. I look to your ladies for lots of ideas and inspiration!! This is amazing!!! Great way to keep everyone up to date! OMG guys this is a great idea I LOVE it. This is such a fun idea! It will be a great time saver for all of us. Thanks so much! Wow, this is such a cool site! Great job ladies:) Thanks for one stop shop!!! I think this is an amazing idea. How exciting to be able to come to one location and see all that is going on and a wonderful way to keep everyone that is following up to date. this is a wonderfully wicked awesome idea! I think this is a great idea. I am excited to be involved from the beginning. This is such an awesome idea. I follow so many blogs, it is hard to keep track of all the challenges. This would be such a great time saver. I hope everyone gets involved and posts here. Thanks so much. Sounds fabulous! I love the idea of getting an email with all the events and challenges in it. Can't wait for the first one! This is an awesome idea. Way to go!can't wait to start seeing all the fun stuff in one place. How cool! We have been needing this forever! Is this the secret? This is awesome!!! I hope it's not overwhelming for you two! I am always looking for new challenge blogs and events! Absolutely wonderful idea!! I'm so excited to hear that this will now exist for all of us! Yaaaay! What a great idea...I'll be back checking regularly! WHAT AN AWESOME IDEA.i LOVE IT. Great idea, a one stop spot for all the fun going on! Thanks!! Awesome idea!! This will be soo helpful! THANKS FOR YOUR TIME ON THIS..WILL BE OF A LOT OF HELP! What a great idea!! Sounds like alot of work, but I'm so glad you guys want to do it. I can't wait to see all the fun happenings in one place :) Thanks!! I think this is a fabulous idea! Especiaslly for those of us with CRS who read about some event then can't remember which blog, fb page or site we saw it on! this sounds like a really cool idea! I love seeing one place to check out all the things I have to hunt for now! Thanks for doing this, it is really cool! Genius Idea! You ladies are FABULOUS! EXCELLENT IDEA! I am constantly updating my dry erase board with a list of challenges and blog hops, so to have it all in one place will be so helpful! This is genius! Thanks for all of your work on this! Great idea!!! Can I put your blog feed in my iphone & android app - crafty card gallery? That way the users of the app would be able to keep up too! AWESOME!!! I'm new to blogging and I've been trying to keep track of all these challenges on my own - hard! And I don't want to miss anything ever!! YAY!! What a GREAT idea!!! Hope it helps everyone keep track of everything going on!!! What a great idea! Being new at following blogs this will mean more time to create and less time searching online. I think is so totally cool! A place to find out what's going on around the blog. Great idea Paula and Momo you gals are awesome! What a great idea...looking forward to following all of the blog hops, giveaways, etc. Such a great idea. I have often wanted to know what all the challenges are without finding all of them. Thanks for putting this together. What an awesome idea, thank you ladies, this will be beneficial to all us crafters!! I have soooo been waiting for something like this as I am sure so many others have as well!!! This will save so much time and give us more chances to participate in more challenges, hops, and other such goodies! Thank you for this awesome blog! Wow!!! What a fantastic idea! I am so excited to think that you thought of this. It sounds as if you have done a lot of hard work on this blog. Thanks for all you have done. What an awesome idea!! I hope you plan to also post the winners of the blog hops and events posted on here. Would be awesome to have one place to come look, especially on the longer blog hops in which not everyone posts the winners on the same day. Thanks so much for organizing this. Love the idea. What a great idea!! You girls are brilliant. Yay! Congrats on your new site! I love the idea of having all this information organized in one place! Thanks so much! I was just thinkng to myself that wished there was a place to see all thw events going for the week so this is PERFECT! love it! This is such a great idea!! You ladies rock. I always lose track of what project I'm submitting where and what day things fall on....this is such a huge help. Thanks for taking on such a huge task!! what an awesome idea! this site should be super helpful and fun. thanks for making the new site. What an awesome idea!! It is so hard to know when different events/etc. are happening when you are new to crafting!! Great source! THANK U THANK U THANK U!! Oh, this is great! Thank you for such a useful resource! I can't wait to get started. What a great ideal, you two hit the nail on the head! At least I think that is how that saying goes LOL! Looking forward to viving this blog on a regular bases. I'm a follower now, I submitted my email and I will follow the blog on FB too. Thank for this great blog! This is awesome! I was just thinking the other day that it would be great to go to one spot to find out all of the challenges that were going on. Thanks for the blog and giveaway! Super fun! I think it can help keep track of all the challenges! Oh this is great. I am going through literaly dozens of blogs and they take me to other blogs and so on. It would be great to go to one place to see all the events and then pick what you have time for. I will follow and subscribe. Awesome idea! Thanks so much for keeping us up-to-date on all the FUN! You girls are amazing! This is something I have been looking for because it is so hard to keep track of all the challenges, hops, etc. that are going on. So to just be able to come to one blog instead of twenty trying to figure out who is doing what will be a great time saver and will give me more time to craft! Love the whole idea girls!!! I am so happy I found out about this group! Thank you so much for doing this for all of us! It will be fun to see what all you come up with! Fantastic idea! I cannot wait! What a great place for a source of information. There is always something going on so this will make it a little bit easier to pick and choose instead of just stumbling upon an event. This is such a great idea!! Thanks for the chance to win! OMG where have you been all my life! I think this is an excellent idea and I believe that most crafters will definetly take advantage of this great site. Thanks for helping us out Momo and Paula! This is such an awesome idea!! love it. Thanks for doing this.. I can't wait to see what comes next. This is a great idea. Thanks for the info. AWESOME IDEA! It's like one stop shopping!!! What a great idea. It's a great way to keep track of things. I love One stop creating!! This is a great site!!! Thanks!! I love this idea. I am always missing out on things. Finding out just after they are already over so I am all for it. Thank you so very much!! This is so awesome! I was just telling a friend that I found it was confusing trying to keep track of all the goings on...this is perfect! I can't believe what you already do and now taking on another blog. This will be quite helpful to everyone. I hope it goes well for you. Oh my gosh! You guys read minds!! I had made a comment on my blog how there should be a blog for things like this. I am so glad that you two created it. You guys are AWESOME and I love it!! I think this is a great idea. I look forward to all the great events. I think it's a very cool idea. Too many things can get lost trying to keep up! Thanks!! What a brilliant idea Momo and Paula. Talent and brilliance, wow! Thanks for this It makes it alot easier just to go to one blog and find out alot of cool things going on in the crafting blogworld!! I am super excited to see how your new blog will unite the crafters of the world!! I really hope your site flourishes!! I am super excited!!!!! You chicas are awesome!!!! Can't wait! Great idea! Can't wait! :o) Thanks for the chance to win! A fabulous idea! Thanks ladies for thinking of us. :) I will be looking forward to hearing what is going on. WOW what a SUPER EXCELLENT Idea!! I love this!! I always have a hard time following so many events so this makes it MUCH easier! Thanks ladies! Such a great idea. So much easier to get the latest news and to share the big events!! LOVE,LOVE,LOVE IT!!! What a great idea, I am going to love this. Now if I can just keep up with all the blogs. OMG this is the most awesome idea!!! So happy that you gals are starting this!!! I wish you the best of luck!!!! This is the BEST idea EVER!! You do not know how much time I spend trying to find all the different challenges on different blogs or trying to keep track of all the blog hops!! I am sooooo excited about this!!! Good luck to you both!! Love this idea. I would love to have one place to find the challenges. Sounds like a fabulous idea! Good thinking girls! I think it's a great idea! Thanks for helping us out. What a FAB-U-LO-SO idea girls. Thanks so much for doing this. LOVE IT!! I think this is aGreat Idea!! I always seem to lose track of event and challenges. This will be on my tool bar as a daily check. Thank you so much for all the owrk you have put into this! This is A GOOD THING! What a brilliant idea! Very exciting! Such a great idea, I am a new follower and cannot wait to see what happens! what a great spot :-) definately on my faves list!! Great idea ladies! On stop crafting! Awesome idea, ladies! It's so hard to keep track of everything scrappy this days! I look forward to following your new blog adventure. Oh this is TOO fun! Great idea..so exciting! You two are very clever ! What an awesome idea, good way to keep up in the scrapbook world. Good luck and can't wait to see future posts. this is great ladies. It will be so nice to go to one place and find the great things going on. Good luck. What a great idea. It will be much easier to keep up with everybody. I am New to Blogging and This sounds like a GREAT Idea! :) cant wait to see what coming. I'll Pass it on to all my crafty friends on Facebook. Fantastic idea-thank you for making life a little easier for us. I would forever love to win the Forever Young Cartridge. Great Idea!! I'm going to be a follower!! I would love to watch for events in my area!! What a great cartridge to give away-would LOVE it!! Great idea! Thanks for taking the time to make a site to keep us crafters up to date on all the events. Sounds like a wonderful idea!! It will make it so much easier to keep up with all the fun crafting events!! Fantastic idea ladies! What a great way to keep track of everything going on. wonderful idea! for me - all those things are so tough to follow, now it seems it will be easier! thank you! Wow! Awesome idea, girls! It would be wonderful to find info in one place. Thanks for your hard work! Awesome idea ladies! I'm so excited! What a great idea! Thanks so much for doing this! Oh My!!! I am so excited about this page! I have been wanting to participate in more but I am extremely new to blogging and have gotten a little overwhelmed!!! So I can't wait to get my creative juices flowing! Such a GREAT idea!!! One place and we find everything!! Just what a BUSY MOM needs!!! Thanks ladies.. maybe now I can keep up!!! Now why didn't I think of that! What a great idea, it will be so much easier to keep up now. Thanks!! Excellent idea!! So frustrating to come upon a hop and wish I had known about it beforehand! What a great idea, this will make life so much easier. Thanks!! Great idea can't wait to keep up with all the great projects we can follow !!! What a great idea! Thanks for doing this. I'm so glad this was made available.It will be easier to keep track of whats going on. Give yourself a pat on the backs because this is a wonderful idea!!!! Good luck with your new site...it will do GREAT!!! Great idea. I really like the option to find a place where you can find everything avour my interesting. What a great Idea, you ladies did a great job creating this site! Awesome idea! I love that I'll be able to find all of the "happenings" in one spot. I love the look of the blog as well!! What a great idea! thank you for the chance to win. I love that idea!! Specially with the challenges because sometimes I make a project and then I don't even remember for what blog was!! Great Idea!! TFS!! Take Care!! LOVE this! Brilliant idea! So excited :) Thank you so much! Awesome and what a perfect way to keep up to date on everything! Looking forward to this! This site is a great idea. I will be back here often! Love it!!! What an awesome idea ladies! I will post your button on my blog! I think this is an awesome idea. I like to know what is going on but usually miss something. Way to go ladies. Aww, thanks ladies! This site will help me out tons! I always get frustrated trying to remember where everything is at, lol! You guys rock for doing this! This is going to be great. Lvoe to stay up to date with everything. Thanks. This is a great idea! There are way too many things going on every week, and I usually catch them too late. Thanks so much! This is an amazing idea! Great thinking gals! Great idea! It is hard to keep up with all the posts! Thanks for the giveaway! I concur - great idea! I often don't participate because I can't keep track of all that is out there! Wow! This is a genius idea! I hate missing events and this blog will help everyone stay up to date! thanks for your hard work guys! You rock! What an awesome idea. Thanks for doing this for us. You guys rock. What a great idea! I already started following on google reader!! I'm looking forward to seeing what's to come. My personal favorite is freebies, so please throw in a few of those. Thank you. OMG Momo and Paula this site is the Bomb!!! I am so grateful for all the work you guys will be putting into this project! Thank you so much! Great idea! Thanks so much for doing this! Thanks for the chance to win! What a great idea, one place to see what is going on. Sounds like an exciting, useful idea! Can't wait to see more!!! What a great idea I've been actually looking for this out there and could not find anything. Fabulous idea!! It will be great to have everything in one stop then I won't miss things anymore!! What a great idea! I will be checking in on this all the time. I have a blog that I tend to neglect, but I am trying to get myself motivated to get it going again. You girls are an inspiration! Thanks so much for taking on this huge endeavor. It's an awesome idea. Good luck and best wishes for a huge success! Thanks! This a awesome idea ladies. I really cant wait to get started. Best of luck. It's gonna be very helpful! Great idea!! Can't wait for it to get started! Looks like this is going to be a lot of fun! What a great idea! Can't wait to see! I love the idea that I will have one stop shopping here! I agree this will be a TON of work and so appreciate you ladies doing that for us. this is a great idea!! loveeee it!!! What an awesome idea. You are right, it is hard to keep track of all the challenges and bloghops, etc. I am so excited for you ladies!! !